You’ve crunched the numbers, determined the right space, and are finally ready to build that new deck. But with all the material options that are out there, you can easily get lost. Years ago, wood served as the only choice for homeowners. Today, though, there’s composite lumber, plastic decking, and so many other possibilities. How do you know which is best for your project? In this blog post, we will try to help you answer that. Aluminum – If you live in an area that routinely gets hit hard by extreme weather, it’s a good idea to consider aluminum. This material won’t rot, rust, warp, splinter, or crack. In addition, aluminum is slip-resistant and rarely peels or blisters. In comparison to wood and composite lumber, aluminum decking is much lighter, but also quite a bit stronger. One huge plus of aluminum is that it actually stays cooler in the sun than other decking thanks to the material’s heat-dissipation properties. Undoubtedly, there’s a lot to like about aluminum. Just keep in mind it can get expensive in a hurry. Composite – As explained in this article by Popular Mechanics, composite decking has become the fastest growing option of the bunch. It’s important to know ahead of time that most composite materials are made from polyethylene or polyvinyl chloride, and come in various colors. In contrast to wood, composites are extremely low-maintenance and never need to be sanded, refinished, or stained. The maintenance issue you may run into, though, is that mold and mildew can grow in shady or damp areas of the deck. Tropical hardwoods – Exotic, rich-grained woods such as cumaru or mahogany offer incredible durability and natural resistance to rot and insects. If you’re interested in tropical hardwoods for your deck, just know that they’re relatively expensive. Plus, the majority of them don’t accept stains all that well, so make it a point to apply a UV-blocking clear wood preservative every few years for protection purposes. Redwood and cedar – Those who have owned a deck before may already be familiar with the benefits of redwood or cedar. Both provide rich color and natural beauty that you typically can’t get with other decking materials. Just keep in mind that the level of bug and weather resistance is directly related to the amount of heartwood in the boards. As far as maintenance is concerned, redwood and cedar require an annual power washing and coat of finish every few years. Premium-treated lumber – This remains the top decking material sold today. In fact, nearly 75 percent of all new decks are finished with premium-treated lumber. Frankly, it’s easy to understand why it’s so popular. Homeowners love that it’s affordable and available coast-to-coast. Deck contractors, meanwhile, appreciate that it’s easy to install. Just be aware that with these decks, it’s imperative to perform routine maintenance. Why Choose Our Deck Builder? 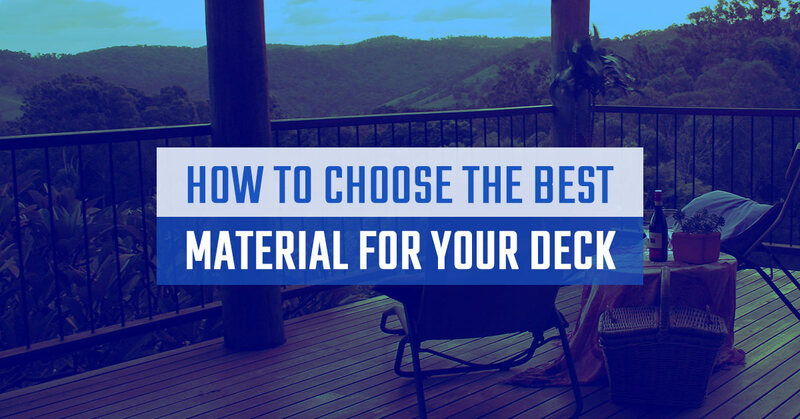 At Ready Decks, you can expect your deck installer to use only the best materials. Unlike other local deck builders, we use premium-grade, treated lumber that will look great for years. Boards are hand-selected at the saw mill, guaranteeing freedom from knots and heart-of-pine boards. Plus, our outdoor deck builder uses ACQ-approved ring shank fasteners that are designed for speed, durability, and strength. If you’re looking for a reliable deck installer, don’t choose just anybody. We strive to make affordable decks a reality for homeowners. Call us today.